It’s been waiting. It came from the old house to the new house when we moved. And then it waited. In the basement. In pieces. And when those pieces came to Linderhof, they were put back together, missing pieces recreated and then it sat in this basement. Waiting. It knew some day that it would get a new lease on life. That it once again would be sat in and loved and climbed upon and be part of the family. “It” is an old rocking chair. A child’s rocking chair. That was mine when I was a small child. The earliest picture I have of it is when I was 5 and mother took it outside, I sat in it and held my baby brother. That picture was our Christmas card that year. 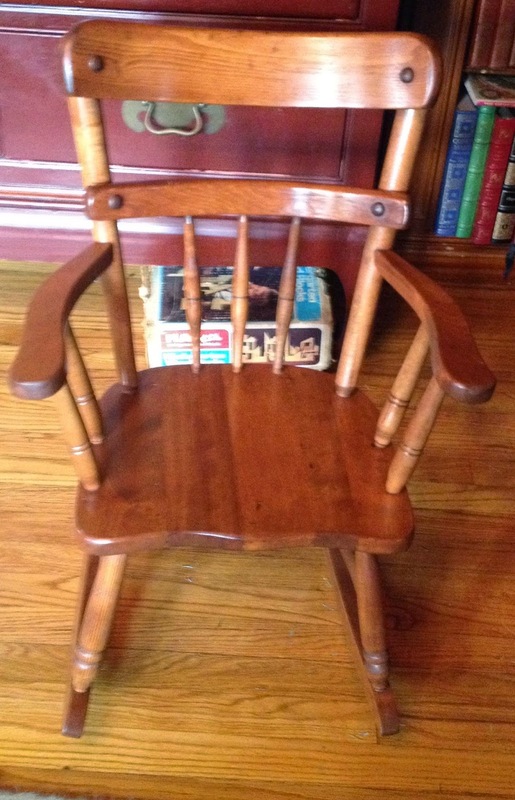 The banged up rocking chair was given to friend Shirley Ann’s husband, Jack. Who, is indeed a Miracle Worker when it comes to wood. He’s built furniture for Shirley Ann. Beautiful pieces of furniture. He’s done a lot of the wood work on their beloved house, recreating what wasn’t there. What better hands to put this relic of a chair into! And he rescued and refinished The Rocking Chair. It looks like new except for the patina of age in the wood (the knicks and dings that children so often do to furniture). The rocker . . . it’s been waiting all these years for Lucy. It was her Christmas present. A joint present — from us and from Jack! Jack and Shirley Ann came over Christmas night for a visit. Lucy was proud of her chair and had to show it to Jack! She pushed it close to him and then climbed in! There isn’t any better gift than a gift from the heart and that’s what Lucy got Christmas morning. On the bottom, we put my name and birthdate, Lucy’s name and birthdate and that picture of me in the rocker. And Jack signed it, too! That’s a very special part of a very special chair! And at Andy's family's Christmas it remained in the car. Sarah said that her face lit up when they brought the chair up and put it in the living room! To get "just the right place" for it! Very satisfied with her chair! What a wonderful thing to do and such a precious gift. 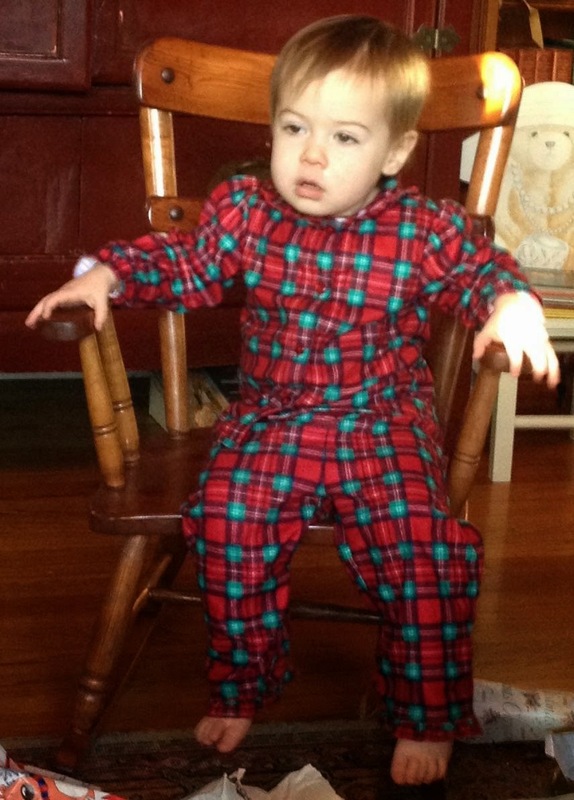 I have the little rocking chair from my sons and now my grand-daughter sits in the same chair. I love saving things and passing them on. Those are the best gifts ever. Thank you so much for sharing with us. What a special gift for Lucy and her parents to treasure! 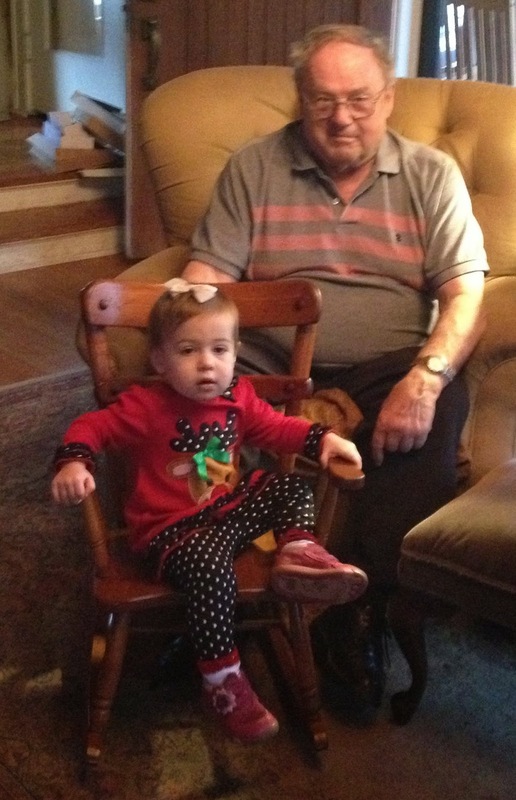 It's a sweet little chair and she is a precious little girl! I emailed you the link on the willow planter baskets, but it said you're "over quota." If you go to Amazon and search for Your Hearts Delight Willow Planter, it should come up! It's on back order though. I ordered before Christmas, but I'm patiently waiting! Happy New Year! IT is a "perfect" gift,indeed!!! I adore the photo of Lucy sitting next to Jack!!! Priceless!!! Sounds as if Lucy has some of G'Ma Martha's decorating qualities. . .loved the story of her getting into just the "right"spot!!! Thank you for sharing this Christmas of the Heart story with us!! !